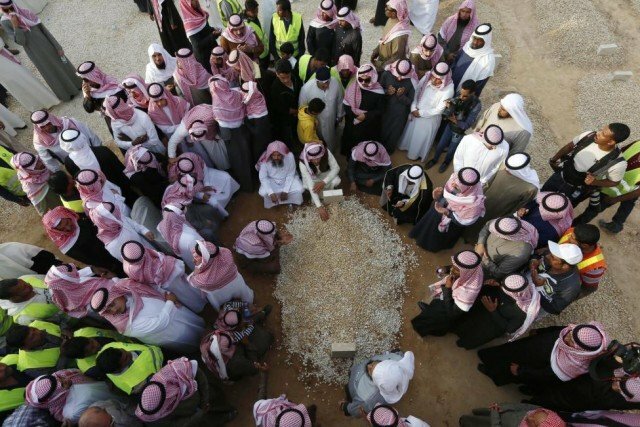 Late King Abdullah of Saudi Arabia was buried on January 23 in an unmarked grave in a public cemetery in Riyadh. Leaders of the Muslim world and thousands of Saudi subjects paid their final respects to King Abdullah at a simple ceremony at a Riyadh mosque after Friday prayer. In accordance with royal custom, the body of King Abdullah, who died at 1 AM., was swathed in white and laid out for visitation at the Imam Turki ibn Abdullah Grand Mosque in the capital. The afternoon funeral was attended by Middle East monarchs and a few presidents from countries near enough to Saudi Arabia to travel to the ceremonies that by Islamic practice must be conducted before the next sundown following a believer’s death. World leaders who plan to attend memorials scheduled this weekend sent condolences and praise for King Abdullah’s role as a mediator between the West and Islam. Jordan’s King Abdullah II left the World Economic Forum in Davos, Switzerland, to attend the funeral and declared 40 days of mourning in his own kingdom. Palestinian Authority President Mahmoud Abbas declared “much sadness” at the news of King Abdullah’s passing and announced three days of mourning in the Palestinian territories. Iran, Saudi Arabia’s chief rival in the Muslim world, sent condolences to the Saudi people and said Foreign Minister Mohammad Javad Zarif would travel to Riyadh to pay respects. Saudi Arabia’s more austere form of Islam eschews public displays of grief and elaborate ritual, even for its monarchs, who are among the world’s richest men. King Abdullah was reported to have a net worth of $20 billion. The funeral was open to the public, including women in their separate section of the mosque, and shops and businesses will remain open during a three-day mourning period.